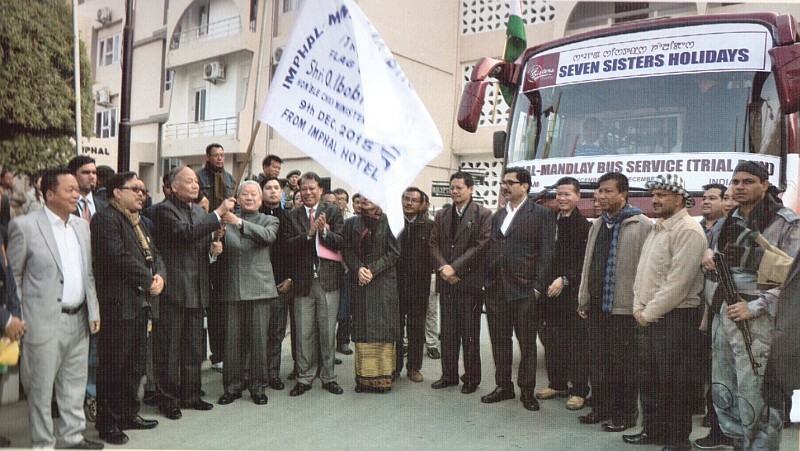 The trial run of Imphal - Mandalay bus service on 09th December 2015 which was flagged off by Hon'ble Chief Minister, Manipur from the premises of Hotel Imphal, North AOC, Imphal was a historic occasion not only for the Transport Department but for the entire State. The Manipur Legislative Assembly had passed a resolution on 01.08.2003 for introduction of the bus service to bring better connectivity between the people of the State and Myanmarese particularly, the Manipuries who are residing there. Ever since then, it has been a long journey leading to the final trial run not only for the State Govt, and the MoRTH, Govt, of India but also other line Ministries whose clearance were mandatory. 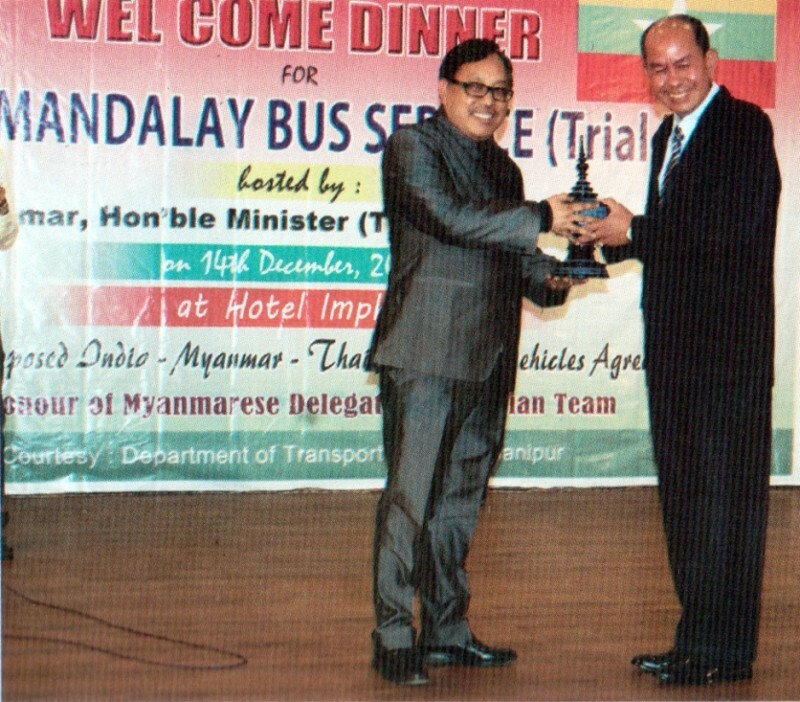 In June, 2014, Gol sent an Inter-Ministerial team to Nay-Pyi-Taw for discussion which was also represented by the Transport Deptt., Govt, of Manipur which was followed by a technical joint survey team visit upto Mandalay during January, 2015 to check and finalise the route for the bus service. Imphal - Mandalay is about 579 kms. approx. if we take Yargyi road which is not a all-weather road at present. Another route is via Gangaw which is a fairer road but with a distance of another 121 kms. longer. The Indian team comprises of 31 members including Tour Operators and a contingent of 24 State Govt. Officials representing various Deptts. Though, originally the trial run was to terminate at Mandalay - finally it had to terminate at Nay-Pyi-Taw which is 859 kms. 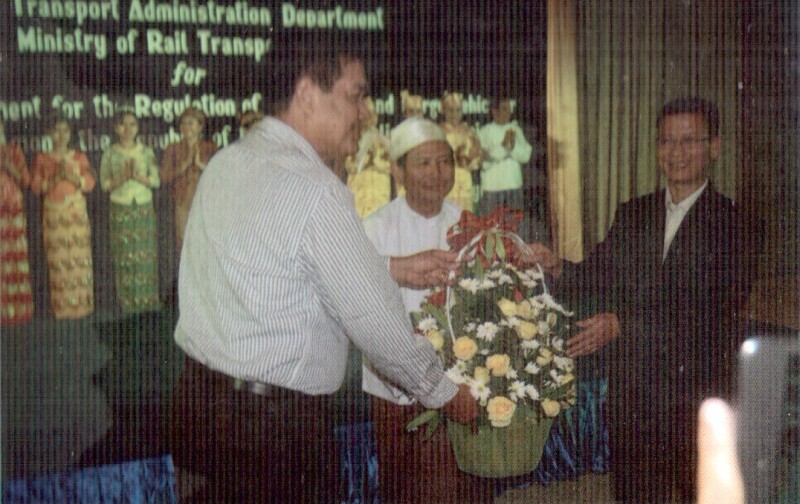 from Imphal as arrangement became part of Regulation of Passengers and Cargo Vehicular Traffic for the IMT (India-Myanmar-Thailand). There are about 10,000 Meiteis/ Brahmins population in Mandalay. Obviously, there was a big thrill to the Manipuri Myanmarese who had come to participate in the recently concluded Sangai Festival, 2015. The historic opening of bus service will be a boon to the relations between the peoples of the two countries besides paving new opportunities for Trade and Commerce. In other words - this may be considered as a great leap forward in the Act East Policy agenda leading to the opening of Manipur and North East to the South East Asia finally. The bumpy and bad stretch of road is between Kalewa and Monywa on the route via Yargyi road which is about 184 kms. Out of this 101 kms. is the worst consisting of land slide zones, steep slopes etc.,. The rest of the road is tolerably good. More than anything else, the popularity of any venture lies with the acceptability and social value attached to it. The fatigue and exhaustion of the long and ardous journey was easily overcome by the warm hospitality and response of the Myanmar people. Days are not far when a Manipuri can buy a bus ticket for a trip to Mandalay or may be beyond say, Bangkok which should be hassle free. The objective is ultimately - seamless travel all along upto Bangkok once the Trilateral Agreement on MVA (Motor Vehicle Agreement) is signed between the IMT parties early next year. What remains to be done are - fare structure to be worked out, designated points for halts to be identified, visa/ clearance for the travel. All these will be finalised once the MOU between the Gol and the Myanmar Govt, is signed. From the Gol side - full satisfaction has been conveyed by the MoRTH from the trial run. A detailed report is being submitted to the Ministry as desired by them. 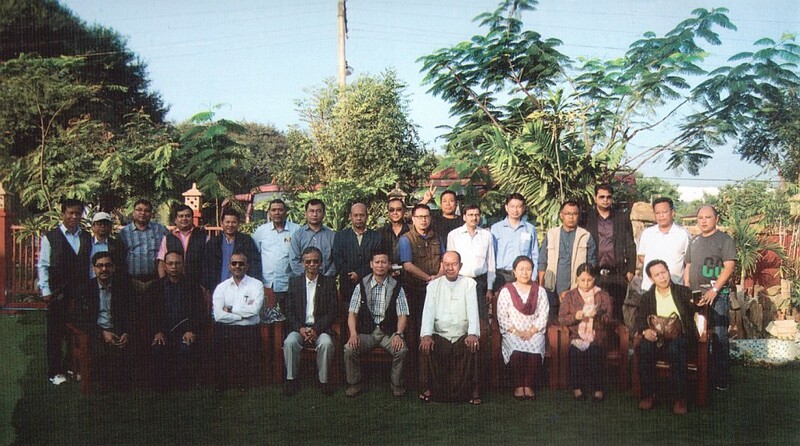 The response of the Myanmar side could be gaused from the deputation of a team by their Govt. - who accompanied the Indian team and arrived here on 14/12/2015. The team came in 8 SUVs led by Myanmar Transport Director U Thin Myant Thu comprising of 27 members mostly from business beckground; There was a reception in the evening with cultural programme followed by dinner hosted by Hon'ble Minister (Transport), Govt, of Manipur. The next day i.e. 15/12/2015 - there was a round of sightseeing of Kangla Fort, Govindajee Temple, Babina Diagnostic, JNIMS, etc., followed by an interaction session with the local Manipuri Traders Association before their departure in the afternoon. After witnessing all the paraphernalia - we can now proudly say that regular Imphal - Mandalay bus service is getting introduced which will be a dream come true for the people of the State both residing here and Myanmar. It is truly a historic chapter for the Manipuries in ' particular - a dream come true for one and all. This article was posted on March 06, 2016.